Egypt - Where We Work - International - World Education, Inc.
World Education began working in Egypt in 1997, with the USAID-funded Market Links Program for Women which increased the capacity of local institutions to improve the conditions of poor Egyptian handcraft producers. World Education provided training to women’s groups to expand the sale of their handicrafts through market research, the development of business plans, improvement of quality control, and establishment of new product niches. Other World Education projects in Egypt have improved education and literacy, health, and community development. In the early 2000s, World Education worked to improve the country’s educational system, especially for women and girls. 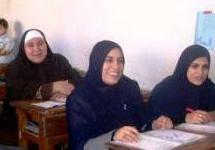 The Egypt Education Reform Program (ERP) addressed the lack of community involvement in education and deficiency of proper resources, and the Girls’ Improved Learning Outcomes project (GILO), a three-year program started in 2008, which aimed to increase the educational enrollment and achievement of girls in Egyptian schools. World Education has also worked closely with Egypt's national adult literacy organization, the Adult Education Authority (AEA), to develop plans for adult literacy throughout Egypt and to improve the quality of literacy programs at the district and local levels. World Education implemented interventions that built the capacities of teachers and literacy facilitators around the country. Today, World Education is implementing the Literate Village program, which is strengthening women's and children's literacy. Through these programs and others, World Education has worked to improve the educational and economic lives of Egyptians. World Education is institutionalizing STEM education in Egypt through teacher education and school strengthening. Girls' Improved Learning Outcomes (GILO) was a three-year project that aimed to increase the educational enrollment and achievement of girls in basic, primary, and preparatory schools in Egypt. For adult learners, the classroom presents challenges different from those of younger students. "Please educate me if you love me," was nine-year old Yasmine's plea to her father.